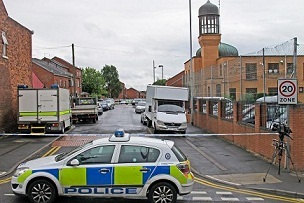 The evacuation of a mosque in the West Midlands region of Walsall after the discovery of a suspicious item in the worship place is coming as a new shock to the Muslim community in Britain. “It's a very big shock for the local community,” Ali Mahmood, the chair of the local traders' association in Walsall, told The Sun newspaper on Sunday, June 23. A suspicious item was found in the grounds of Aisha mosque and Islamic center in the Caldmore area of Walls. Army bomb disposal experts were dispatched to the area to inspect the item and ordered the evacuation of around 39 homes surrounding the mosque. "People in the affected area and who are unable to make alternative arrangements are being taken to Walsall Town Hall where they will be cared for,"a police statement said. Bomb disposal experts are still working to establish whether or not the package is an explosive device. "We were told by the police that there was an incident of a serious nature,”said Viyja Kainth, the vice-chairman of a residents' group. "The residents were evacuated in the early hours of the morning," he said, praising the work of Walsall Council in helping those who had to leave their homes. Superintendent Keith Fraser said police were "taking this extremely seriously". “We have launched a full investigation into the suspicious item that has been found, and what’s going to be the key to this is the public’s help in relation to helping us to understand why that suspicious item was in the area,”he said. Residents are worried that the suspicious item is the latest in a series of attacks against British Muslims. 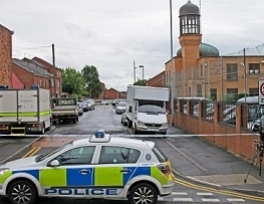 “There is a good community spirit at the mosque,”Mariyah Gilani, a resident, told ITV website. British Muslims, estimated at around 2.7 million, have been in the eye of storm since the machete killing of an army soldier by two converts of immigrant origin in Woolwich, near London, last month. According to Tell Mama project, which monitors anti-Muslim attacks in Britain, 212 “anti-Muslim incidents” have been reported after the Woolwich attack. The figure included 11 attacks on mosques, in a series manifestation of anti-Muslim sentiments. Three Muslim worshippers were stabbed after the night prayers in Birmingham two weeks ago. A fire also gutted the Darul Uloom Islamic school in Foxbury Avenue in south-east London last week, a blaze described by the police as “suspicious”. It came after a suspected arson attack on an Islamic centre in north London. Initials of the far-right English Defence League (EDL) was found scrawled on the side of that building.